The Room Where I Was Held by David Zax opened on Sept. 20 at the Martha's Vineyard Playhouse. It runs through Oct. 6. The set for The Room Where I Was Held suggests a domestic tale—a Neil Simon comedy, perhaps, or a psychological thriller. There’s a tastefully appointed living room, an abstract painting on the wall, a boy’s bedroom up the stairs with a baseball and glove on the desk and a bar mitzvah photo on the shelf. The sound of Arabic music is the first hint that this is a different kind of drama. Just how different is revealed gradually, through a series of revelations that add up to a suspenseful evening with a shocking conclusion. The show opened at the Martha’s Vineyard Playhouse on Sept. 20 and runs through Oct. 6. The play begins with Josh Salazar, a young journalist cultivating a beard, dancing ecstatically—and maybe a bit drunkenly—in his childhood bedroom to music from Afghanistan. “My memories of Kabul are good,” he insists to his father, Alan, who has a hard time believing him. It’s 2011 and Josh was a prisoner of the Taliban until just a few weeks earlier, kidnapped while reporting a story in Mazar-i-Sharif. He emerged from the ordeal emotionally shattered and his parents are so deeply anxious about his recovery that, with his psychiatrist, they’ve developed a week-by-week schedule for what memories can be discussed when. His mother Linda repeatedly invokes the schedule, reminding Alan that kidnapping is a high-level stressor listed in the Diagnostic and Statistical Manual of Mental Disorders (DSM-5). 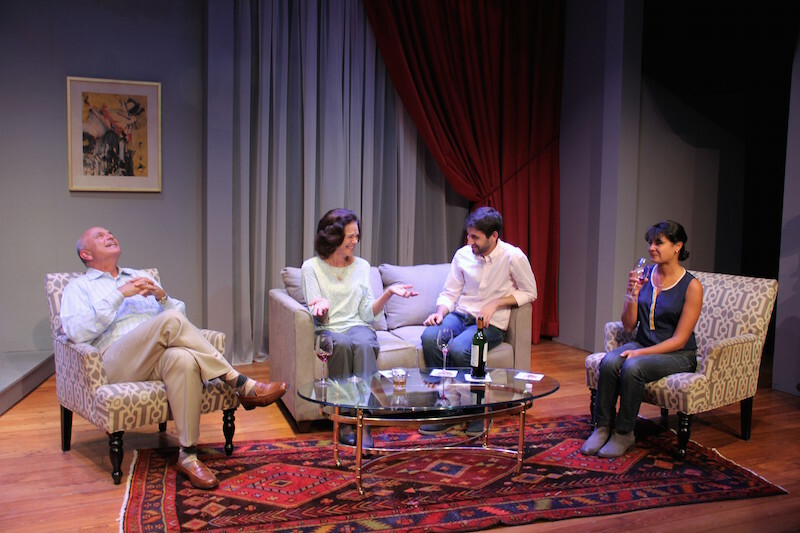 The Salazars, who both still call their son Joshy, are troubled by Hanny’s unexpected appearance at their home in the upscale Kalorama neighborhood of Washington, D.C. Her visit comes weeks too early in the schedule. And they hate their son’s emerging beard, because they know it means he is planning to return to Afghanistan and continue reporting on atrocities against villagers there. Obsessed with fairness, Josh is deeply influenced by his Princeton professor Peter Singer, the controversial bioethicist whose moral scales give no extra weight to humanity over animals or the privileged over the poor. “I took his seminar twice,” he brags to Hanny, while putting down his parents for their affluent tastes. “Why are those people worth less?” Josh retorts. There will be an answer, but it’s not what he expects—and it is devastating when it arrives. The Room Where I Was Held is the first play by David Zax, a former journalist from Washington D.C. who attended Yale, Columbia and New York University. Mr. Zax has reported for the New York Times, Wall Street Journal, Fast Company magazine and the radio program This American Life. While there are some similarities between his family and the Salazars, Mr. Zax told the Gazette that the people themselves are very different. When he began writing the play, as his master’s thesis for NYU, Mr. Zax said he saw more of himself in Josh, the idealistic crusader who wants to make the world more just. Mr. Zax has been involved in the production from casting to rehearsals, rewriting several parts of the play in the process. “I’m really, really pleased with this cast,” he said. Josh is played with a fine balance of righteous fervor and emotional vulnerability by Daniel Bailin in his playhouse debut. Jonathan Lipnick, a professional actor and ordained rabbi, originated the role of Alan in a Monday night reading at the playhouse last summer and was a “no brainer” to return, Mr. Zax said. Mr. Lipnick’s Alan appears at first to be a simple, satisfied man. By the end of the play, his trajectory is nearly as shocking as Josh’s. Kippy Goldfarb’s Linda is a finely drawn portrait of a woman who’s in over her head but will never stop trying to make things better for her family. “It’s only money!” she says almost hysterically after her husband spills red Bordeaux on their $50,000 rug. Directed by playhouse artistic and executive director MJ Bruder Munafo, the production is designed by her veteran team of Lisa Pegnato (set), JB Lamont (sound), Ernest W. Iannacone (lighting) and Cynthia Bermudes (costumes). 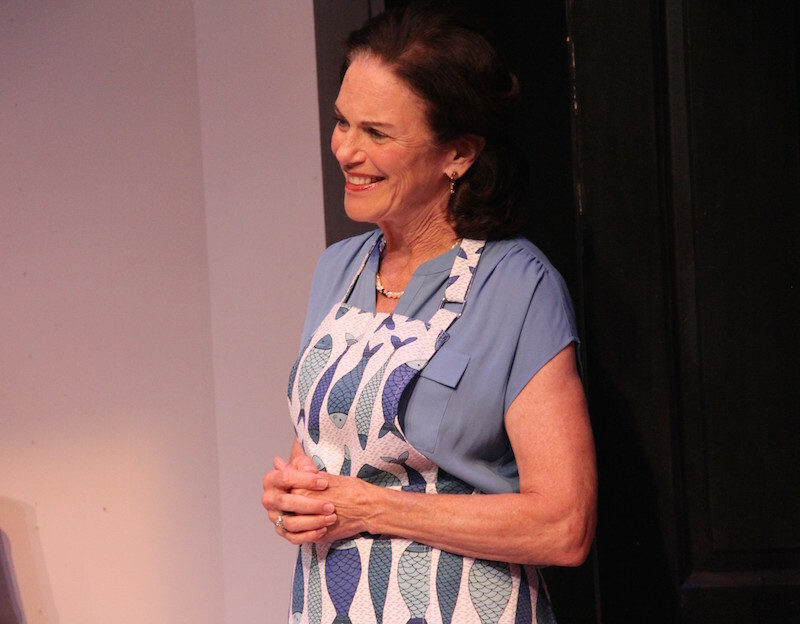 Joining them in her first playhouse production is Jo Maxwell of Chesca’s in Edgartown, a longtime audience member who provided props and set dressing, even sewing Josh’s bedspread and the tablecloth and sheer curtains of the Salazar home. The Room Where I Was Held runs through Oct. 6, Tuesday through Saturday at 7:30 p.m. For ticket information, visit mvplayhouse.org.